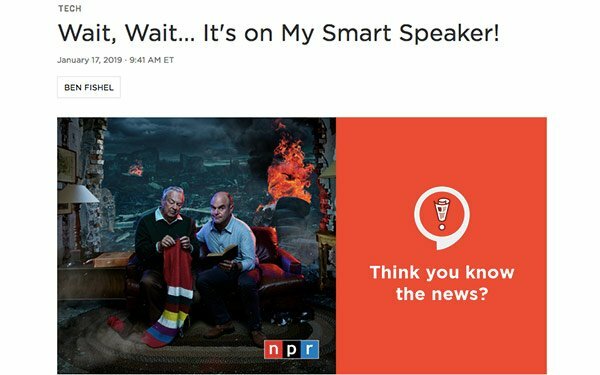 Building on one of its most successful podcasts, NPR has turned “Wait Wait... Don’t Tell Me!” into an interactive game for smart speakers called the Wait Wait Quiz. The new weekly game is available via Amazon Alexa and Google Assistant devices, providing NPR sponsors with a new platform and audience. With 25% of smart speaker owners reported to have used their device to play a game in the last week, that’s a reliable new audience to tap. The Wait Wait Quiz was designed by NPR and developed in collaboration with VaynerMedia’s internet of things division, called VaynerSmart. This is NPR’s first fully interactive smart speaker offering. The Peabody Award-winning news quiz “Wait Wait... Don’t Tell Me!,” the 13th-most popular podcast by audience size, is also preparing to make the move to television. The Wait Wait Quiz offers another opportunity for listeners to connect with brand sponsors and joins a suite of voice-related sponsorship offerings developed by National Public Media, including turnkey 15-second spots adjacent to NPR flash briefings and custom Voice Landing Pages. It provides another new, popular platform for sponsors to take advantage of the voice work NPR has done. According to NPR, its content receives 9.3 million on-demand smart speaker downloads a month and is a default news choice across top voice assistants. The move comes just a week after The New York Times announced it would publish skills within its Sunday edition to connect readers to bonus content on Alexa-driven devices. It will also produce voice skills for brands that want to tap into voice audiences via T Brand Studio. 1 comment about "NPR's 'Wait, Wait... Don't Tell Me!' Podcast Launches Smart Speaker Quiz Game". PJ Lehrer from NYU, January 23, 2019 at 1:29 p.m.